I also have my first ever Friendsgiving happening on Sunday which is making me so excited! Plus NO SCHOOL next week. I wish there was no work too! 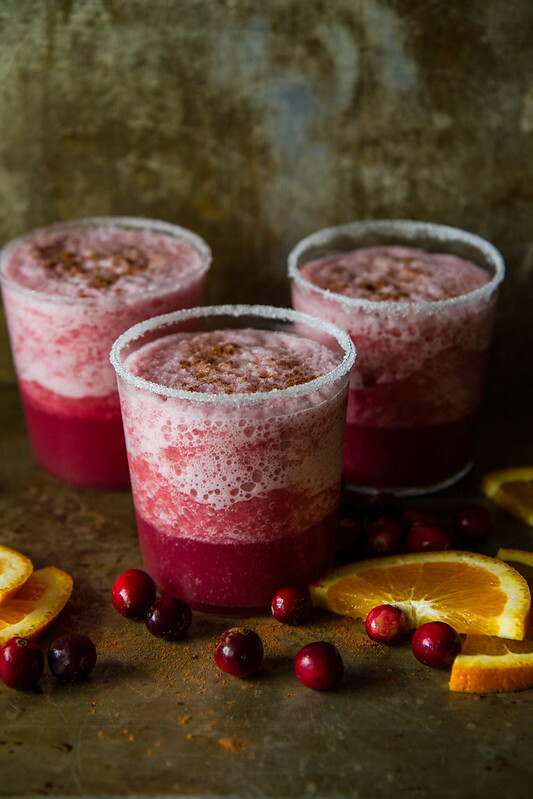 This margarita is an ode to fall with the tart and bitter cranberry, fresh sour lime and sweet orange juice. Plus the little taste of fragrant cinnamon on the rim is the perfect hint of spice to go with the tequila. These would be perfect for Thanksgiving, Christmas or any cozy night. Also- if you didn’t want to serve blended margaritas, you could just shake everything and serve it over ice cubes instead- also delicious! Blend the sugar and cinnamon together. Swipe a lime around the edge of your glasses and then dip the wet rim in the cinnamon sugar. In the jar of a blender combine the juices, Tequila and agave with 2 handfuls of ice. Puree until slushy and well blended and pour into the prepared glasses. 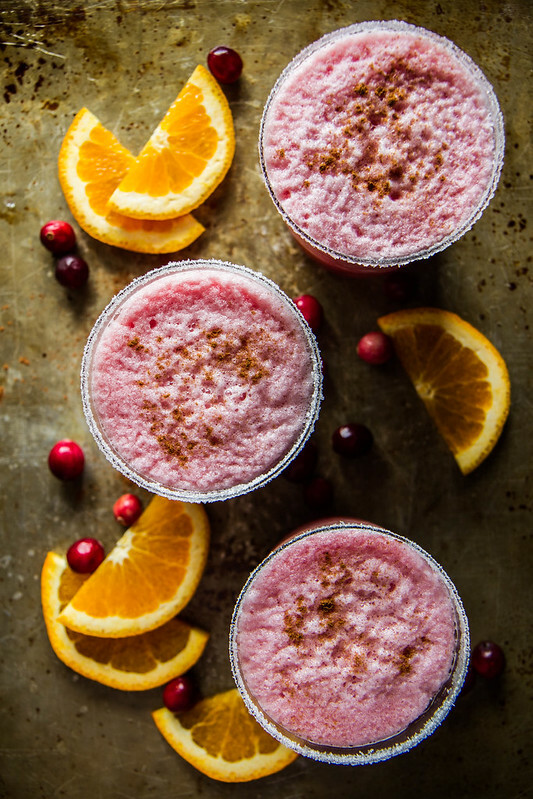 Cranberry and orange is such a classic and unbeatable combo! These margaritas look super amazing! This looks like the perfect drink to serve when hosting Thanksgiving. Love the fall colors and flavors. Tongue popping flavor swirling around here. Yum. Root canals. Bleh. I lost 12 pounds last time I needed a root canal because I was in denial and wouldn’t eat anything for weeks….until I finally got it treated. Oh no Laura!!! (I would take the 12 pounds! )- but this is more post treatment owwies! like just SO sore and trouble chewing!!! these may be my favorite fall margs recipe ever!! CANNOT WAIT to make these! The cocktail queen does it again!! Sign me up for a few of those beauties! 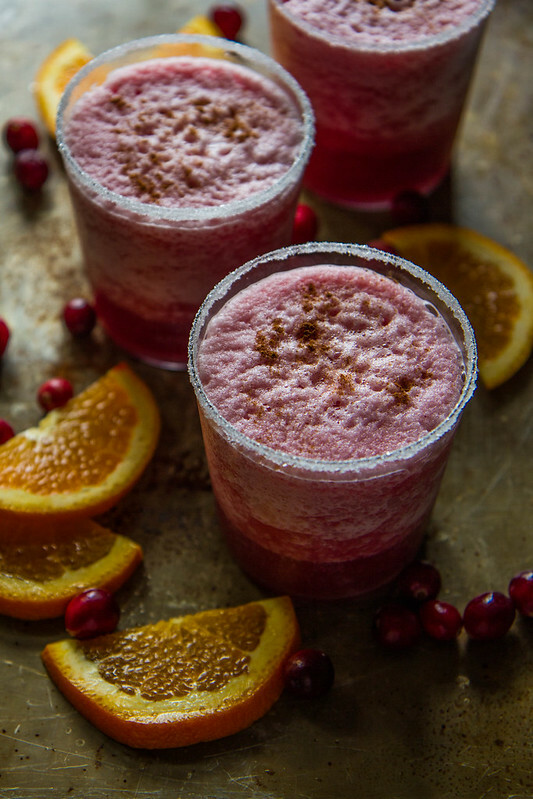 This is the perfect Holiday twist on a margaritas. Love them! Cheers! Send me a large pitcher of this stat! This has been a week! !